Dear oh dear. 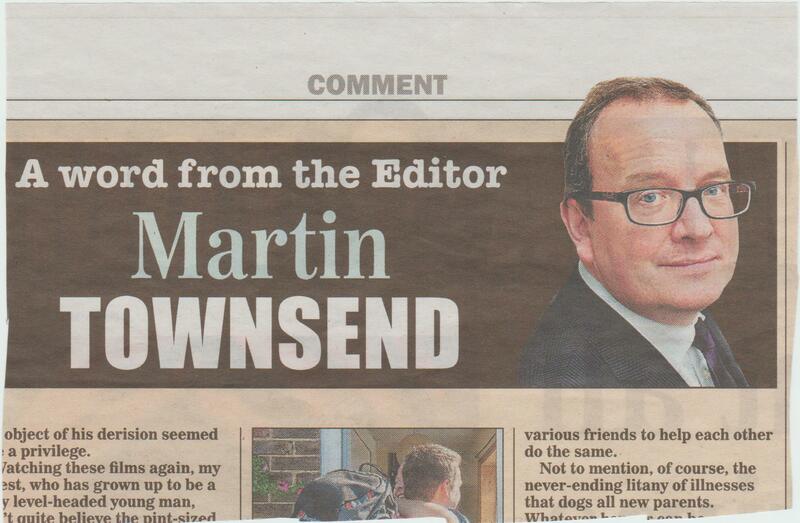 An editor should know better. He has two sons, so they are the elder and younger boys, not eldest and youngest. He could have got away with ‘eldest child’ for the first boy but not ‘youngest child’ for the second boy, because there is a daughter aged 18 who is the youngest child. I don’t think you can say ‘my two eldest children’ either; that should be ‘my two elder children’. 0/10. Incidentally you can say ‘eldest’ or ‘oldest’ for related people, but only ‘oldest’ for unrelated people or things, such as ‘the oldest boy in the class’ or ‘the oldest rocks yet discovered’. PS It has been brought to my attention by my son that younger people find this rule archaic and are quite happy with ‘oldest’ of two. I still don’t see any harm in doing it ‘right’. Hyphens are a problem in this piece. You don’t need one if you are using ‘write off’ as a verb, but you do if you are using it as a noun. So the heading is wrong, but ‘written off’ is correct in the intro, and ‘write-off’ is correct in the second leg. ‘Lime green’ does not need a hyphen. You would not put one in ‘sunshine yellow’ or ‘royal blue’. Incidentally I would say a windscreen is at the front of a car, not at the back. I would use ‘back window’. Please tell me I am not seeing this. The vegetables, of course, are leeks. It’s funny because broccoli is usually the one that gives trouble. This is something you really can’t do. The heading says something quite different from the copy. 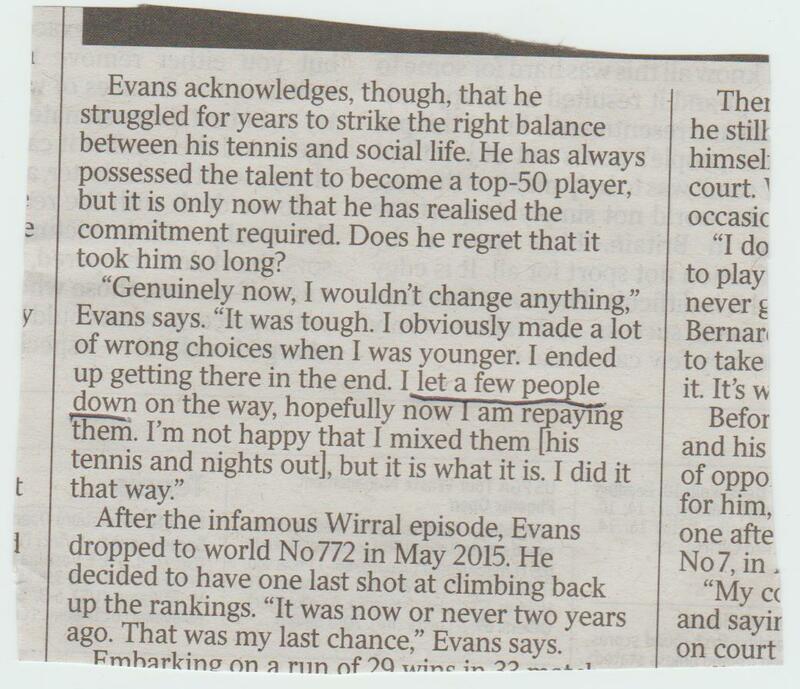 I think Dan Evans has previously said that he ‘let a lot of people down’, but crucially not on this occasion. Apart from being bad practice, in the past headings which go beyond the copy in this way have cost papers a lot of money. Four points handily packaged in one article. 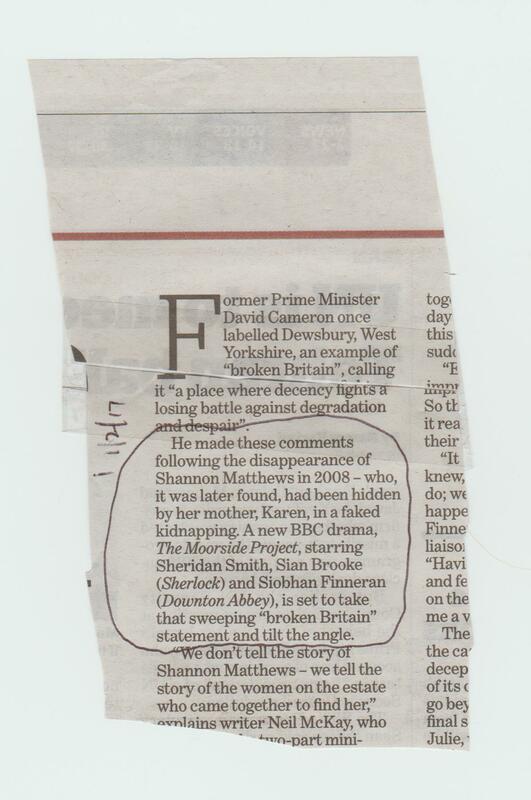 Above, the second sentence would be immensely improved by moving the words ‘in 2008’ so that it reads ‘the disappearance in 2008 of Shannon Matthews – who, it was later found . . .’ This places ‘who’ next to the person, rather than the year. A small change that makes a big difference. Incidentally (third paragraph) I would prefer not to use a quote by a new speaker without introducing him first. I don’t think it makes for easy reading to wonder who is speaking. Not everyone agrees though. Here is a new word, ‘swang’. I can see how this may have happened, because the past tense of many similar words has an ‘a’, for example ‘swam’ and ‘sank’. In those cases the past participle (which is used with forms of ‘have’) is ‘swum’ and ‘sunk’. So you would have ‘the boat sank’ or ‘the boat had sunk’. Presumably the writer did not want to fall into this trap, but unfortunately ‘swing’ does not not follow the same pattern, and both the past tense and the participle are ‘swung’. Further down is the word ‘saying’ in square brackets, to indicate that the speaker omitted the word but that is what he meant. I find this silly. 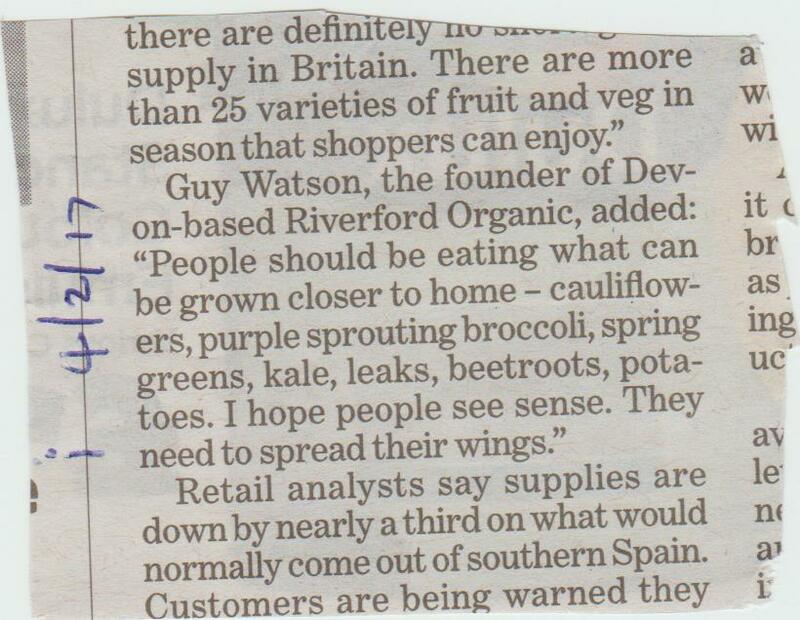 Who on earth would complain about having the word ‘saying’ inserted into a quote? It makes the piece that bit less smooth to read. At the end of that paragraph it would look better, as well as being correct, to close the single quotes, put the full stop, then close the double quotes, rather than have triple quotes. Why is there a hyphen in this heading? In this use, a hyphen connects two words to mean something else, such as ‘ball-boy’. This is wrong. 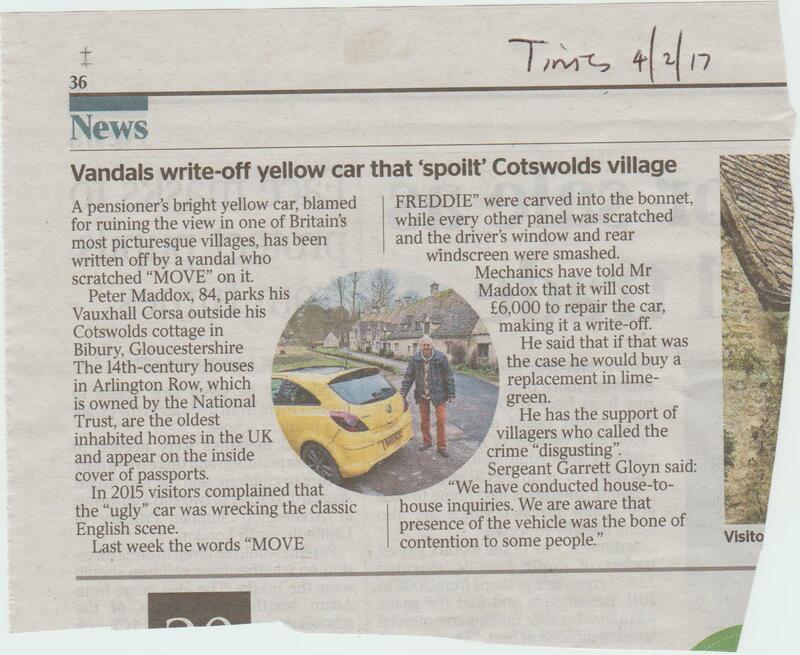 Without seeing the reporter’s copy it is impossible to know what, if anything, the sub has done with this story. However the result is an impenetrable jumble. By referring back to the original press release on the internet, I can see that it, as well as the reporter and sub, has fallen into the trap of suggesting that birds are somehow in control of the colour of their feathers and can change them at will. 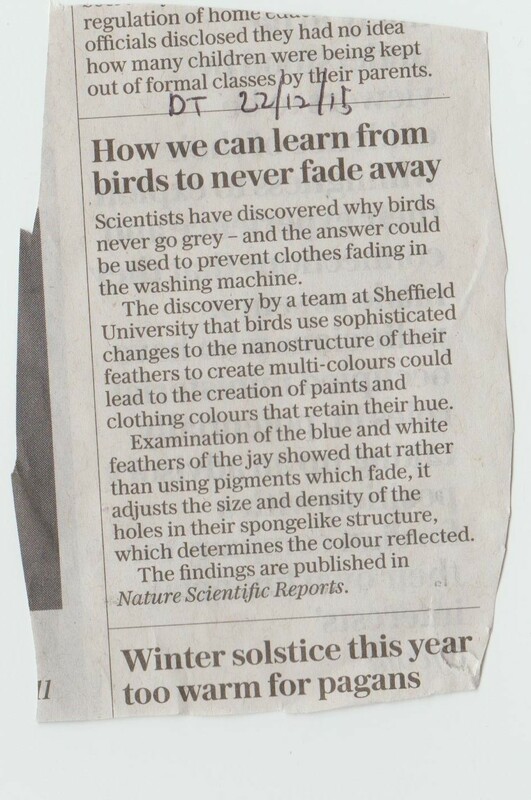 In fact the scientists are simply saying that the colour we see in feathers is due to the structure of them, not an applied pigment of the type we use in dyes and paint. Scientists have discovered why birds do not go grey as they age. The answer could prevent clothes fading with repeated washing. Feathers are made of a spongy keratin material, similar to human hair. A team at Sheffield University found that the precise size and density of holes in the material determines the colour reflected from the surface. They believe this permanent ‘nanostructure’ could replace the use of pigments in dyes and paints, which eventually fade. It is worth saying that although there is an old subs’ adage that any story can be told in 25 words, it is not true, and a story of this complexity should not have been given such a short space. Tell it properly or don’t tell it at all. This was the third incorrect attempt at ‘pastime’ that I had seen within a few months. It is not ‘passed-time’ or ‘pass time’ either. This clipping (which I didn’t cut out very well) also illustrates how the subbing rule that you do not repeat a word in a headline within the same page, let alone on the same story, has gone by the board. In the old days a repeated word was called a ‘rhubarb’. It was probably a rule made to be broken, but I do think the general principle of avoiding repetition if possible is a good one. Here is a reasonably straightforward story made nearly incomprehensible with an attempt at a clever intro, an earlier court case mixed into the second par, and the omission of salient facts. The first question the reader would ask is ‘Why does he steal the eggs and how are they worth £5,000?’ With a bit of research on the internet I learned that Lendrum was caught with the eggs in an incubator, intending to keep them until they hatched and then sell the chicks to Middle Eastern falconry enthusiasts. Just a sentence would have made the whole thing clear. 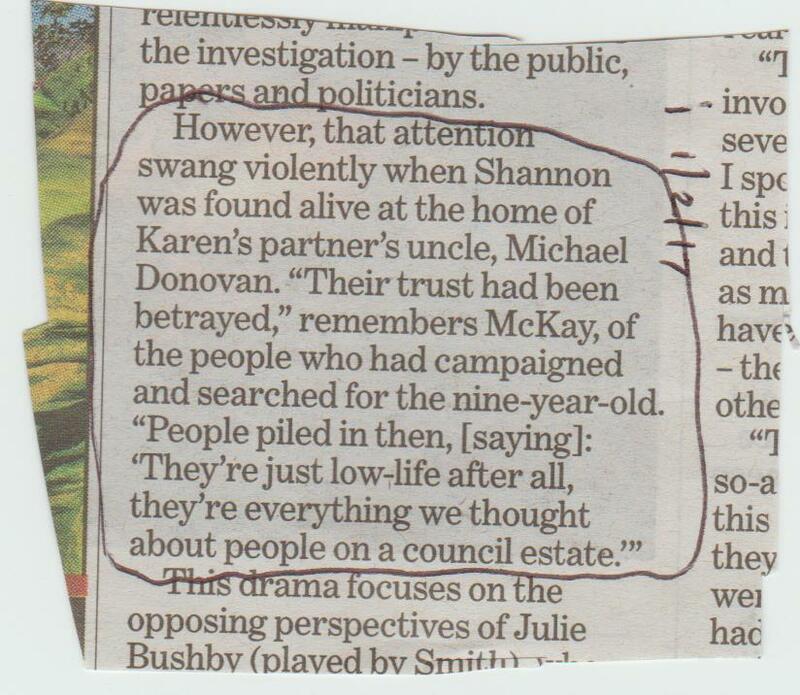 Incidentally I am not saying that the sub should go trawling round the internet and writing in stuff. But if there is a hole in the story you should ask the reporter or the newsdesk to fill it. Obviously that isn’t something I could do in this exercise. It is not clear from this story when he was jailed or when he absconded. I don’t think ‘on the wing’ is a phrase that can be applied to humans. If you want to pursue this metaphor, ‘taken flight’ or ‘has flown’ would be more appropriate. A convicted thief of rare falcon eggs is on the run after being sentenced in Brazil for his latest crime. Jeffrey Lendrum, 55, is considered to be a serious threat to birds of prey in Britain and other countries. The chicks from the eggs can be worth more than £5,000 each. The former member of the Rhodesian SAS, who uses his training to reach remote nests, sometimes abseiling down cliffs or dangling from helicopters, has previously been jailed for stealing peregrine falcon eggs in Wales, and has been arrested in Zimbabwe and Canada. After an anonymous tip-off, Lendrum was stopped at an airport in Sao Paulo a year ago with an incubator containing four albino falcon eggs stolen in Patagonia. 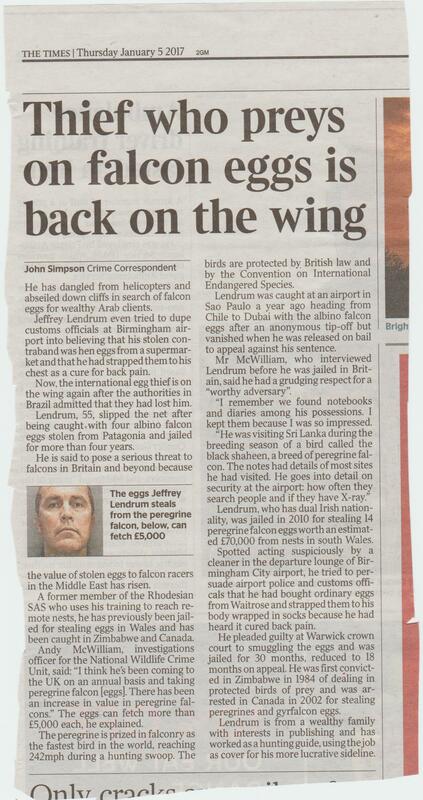 He was en route to Dubai, where he planned that the eggs would hatch and the chicks sold to wealthy Arab clients. The peregrine is prized in falconry as the fastest bird in the world, reaching 242mph during a hunting swoop. The birds are protected by British law and the Convention on International Trade in Endangered Species (CITES). (This is the correct version of the Convention on International Endangered Species which appears in the story). Lendrum, who has dual British and Irish nationality (need to check this, but you can’t just say ‘who has dual Irish nationality’), was jailed in 2010 for stealing 14 peregrine falcon eggs worth an estimated £70,000 from nests in South Wales. He was spotted acting suspiciously in the departure lounge at Birmingham airport (not Birmingham City airport), and was found to have the eggs wrapped in socks and strapped to his chest. He tried to persuade police and customs officials that they were hens’ eggs which he had bought from Waitrose and attached to himself as a cure for back pain. He pleaded guilty at Warwick Crown Court to smuggling the eggs and was jailed for 30 months, reduced on appeal to 18 months. He was first convicted in Zimbabwe in 1984 of dealing in protected birds of prey, and was arrested in Canada in 2002 for stealing peregrine and gyrfalcon eggs. Mr McWilliam, who interviewed Lendrum before he was jailed in Britain, admitted to a grudging respect for a ‘worthy adversary’. (You need this par to follow the previous history so that the reader knows why he is a worthy adversary). ‘We found notebooks and diaries among his possessions,’ he said. ‘I kept them because I was so impressed. This version is basically the same paragraphs in a different order with a straight intro and some corrections. I also found on the internet some interesting detail about what happened to the eggs (one chick hatched and was returned to the wild), but the sub may not have had it. PS: The caption mentions a picture of a peregrine but this must have been removed at some point without changing the caption. As I have remarked, captions are a minefield.